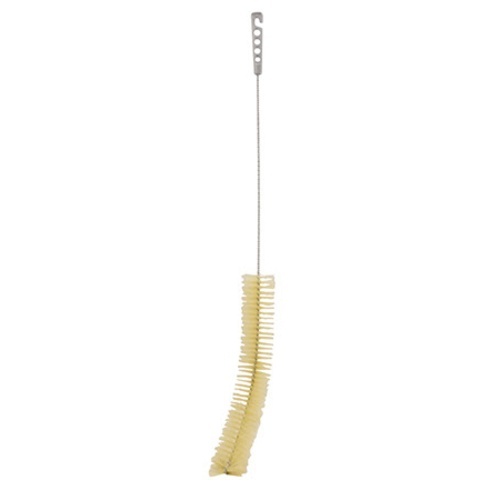 The big mama jamba brush for cleaning those Demijohns. If you have a Demijohn, especially a narrow mouth model, you will need this 37 in long overall dirt buster. Bristles are 17 in long x 2-3/4 in wide. Features plastic handle with hook and hole for hanging. Tip of the brush has a slight curve to better fit demijohns and containers with a rounded bottom. I bought this to clean my plastic conical fermenters. Had to adjust the bend a little. I also have to be careful with the end to avoid scratching. Otherwise it works well. Glad I bought it.